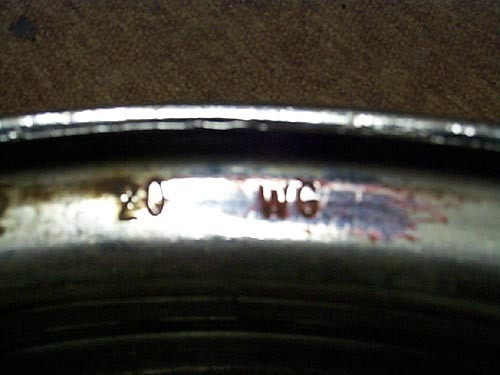 Here is the stamped wheel code of "WG" on the inside lip of the Buick 15" rallye wheel found on 70 Skylarks and Skylark GS models. What is so special about these wheels? They have an additional offset that does not seem significant but once you see a set, you can tell by looking at them that they are WG wheels. The easiest test to tell the difference from the standard 15" Buick Rallye wheel is to place a US quarter on the inner lip. 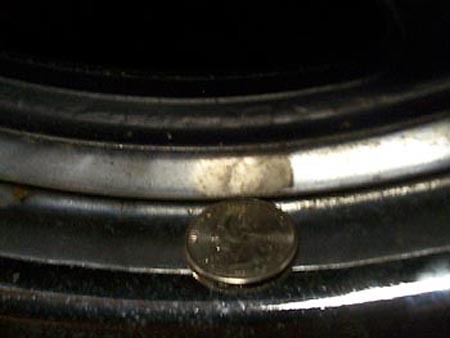 As you can see in the photo above, the quarter rests on the entire lip. 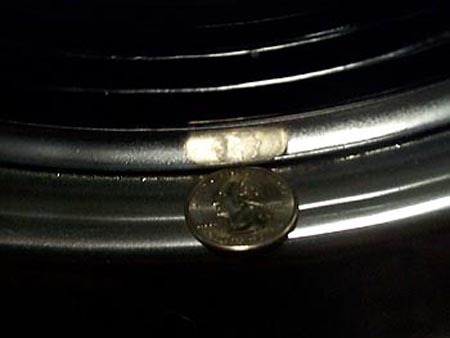 Here is the same test performed on a standard 15" Buick Rallye wheel. Notice in the photo that the quarter overhangs the edge of the inner lip. The difference in the offset is 3/8"
WG wheels have a 1" lip while the standard 15" rallye have a 5/8" lip. The backspace on the WG wheel is 4" and the 71-up wheels are 4 3/8"
Now you can be an expert on the 15" Buick Rallye wheel.